I am the one who is wearing the costume! So I saw something similar as in store costume. But I wanted to add my own thing into it. To make it look cooler! 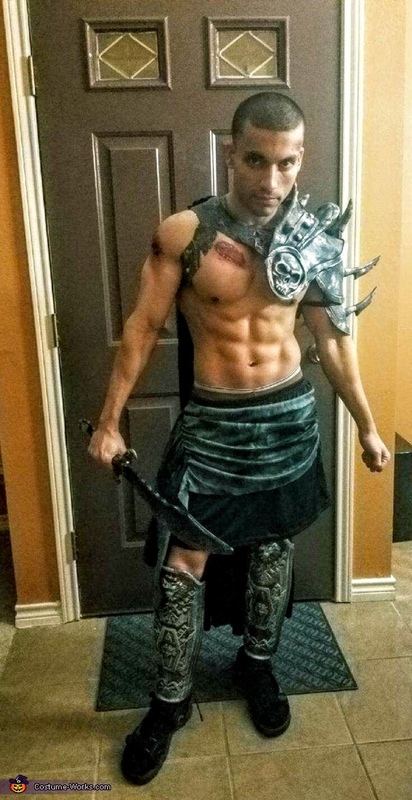 Last Halloween I was dressed as a Spartan! which gave the impression of a hero or the good guy but also bound by rules. So this time I decided to show the other side of spectrum the quote on quote bad guy but also the independent version. To represent that this he is not bound by rules and came back from dead. I used bought different parts to create the costume and sewed the cape in the back. Reinforced the shoulder armor. Added some cuts and make up. Put blood on the cuts to make it look fresh. Overall cost is about $80. It was fun building it. Hope you guys like it.